Here are the numbers that Golbat is represented by in the various Pokedexes. GOLBAT loves to drink the blood of living things. It is particularly active in the pitch black of night. This Pokemon flits around in the night skies, seeking fresh blood. 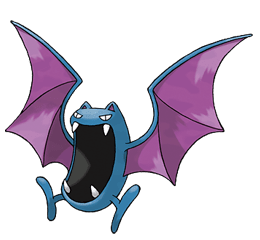 GOLBAT bites down on prey with its four fangs and drinks the victim's blood. It becomes active on inky dark moonless nights, flying around to attack people and Pokemon. Its fangs easily puncture even thick animal hide. It loves to feast on the blood of people and Pokemon. It flits about in darkness and strikes from behind. It loves the blood of humans and Pokemon. It flies around at night in search of neck veins. Height: 1.6 m / 5' 03"
Weight: 55.0 kg / 121.3 lbs. The Pokemon is protected from flinching. This Pokemon will not flinch. Does not prevent flinching with Focus Punch.